Today’s my last day of work! Woohoo! So this coming week, my goal is to find a self hosting site for my blog. That way I can do hops and other good things and have more control over my blog. So if you have any recommendations, that would be great! Last night I was digging through my cupboards wondering what kind of holiday treat could I make. I found a bag of marshmallows and a box of Trader Joe’s Rice Crisp’s, which is basically Rice Krispies. I bet you know where I am going with this. 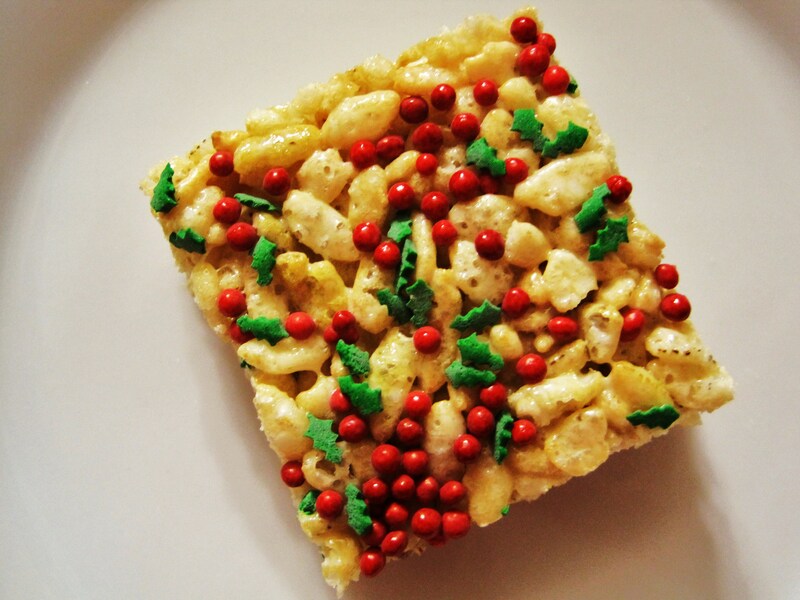 I decided on Holiday Rice Krispie Treats! I haven’t had a Rice Krispie treat since I was a kid, so I decided to whip up a quick batch, and it was quick, about 5 minutes it took to do it all! Needless to say I never actually had one of these treats! But my Husband and his co-workers did. I was planning on taking this batch to my work, but my Husband was kind of sad, asking if he could take it to his work. How could I say no? He told me half of the batch was gone by 10am and by noon they were all gone! I guess they were a hit! 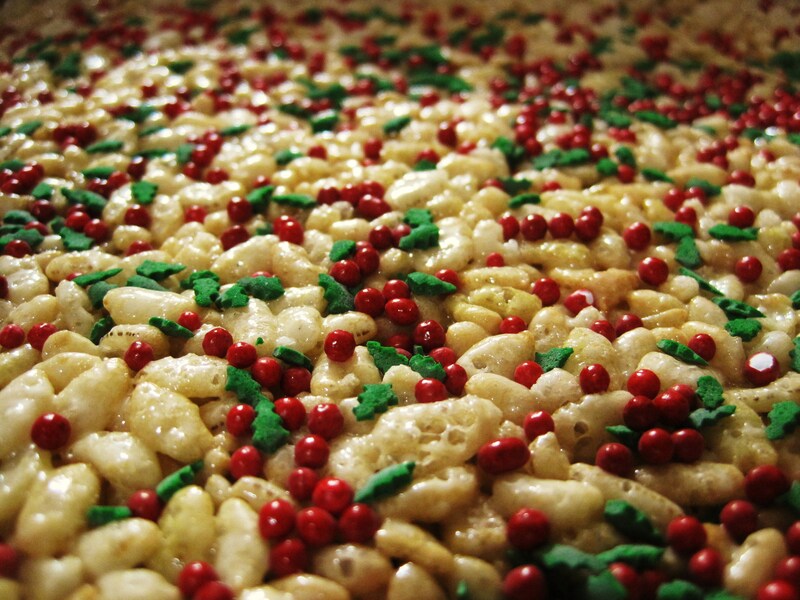 It only took one bag of marshmallows, 6 Cups of cereal and 2 tablespoons of butter and some holiday sprinkles (bought from Target in the dollar bin), so easy! The best part was the calories! It was way lower then I thought! 75 calories a treat and virtually no fat! Optional: Sprinkles or Jimmies for fun! Spray a 9×13-inch pan with cooking spray and set aside. Heat a large saucepan on low heat. Melt butter spread. Add marshmallows and melt on low flame. Stir until completely melted, then remove from heat. Add Rice Krispies to the melted marshmallows, and stir until completely combined (you will need muscles here). Press into the pan using wax paper. 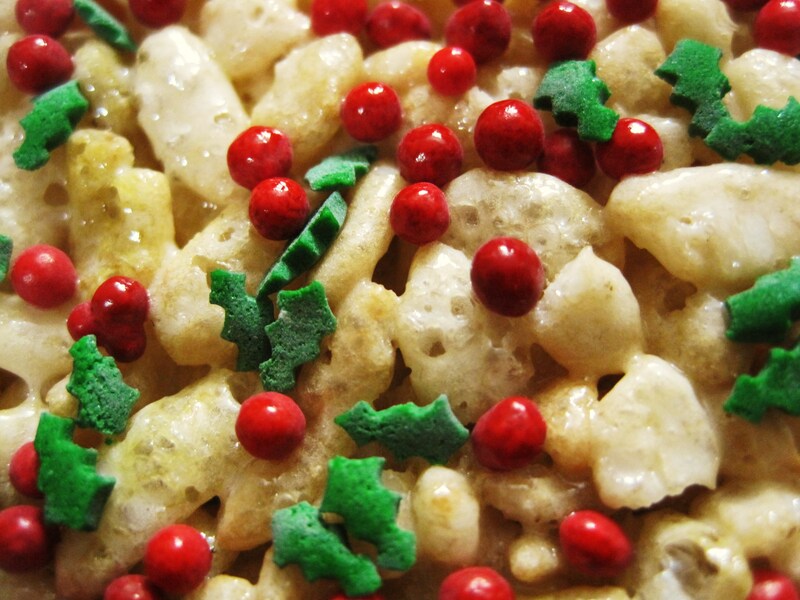 Optional: Sprinkle with holiday sprinkles or Jimmies and press into Rice Krispies. Let it cool completely about 30 minutes, cut and serve! I didn’t calculate the sprinkles into the calories. These were so fun to make! It really did remind me of childhood! 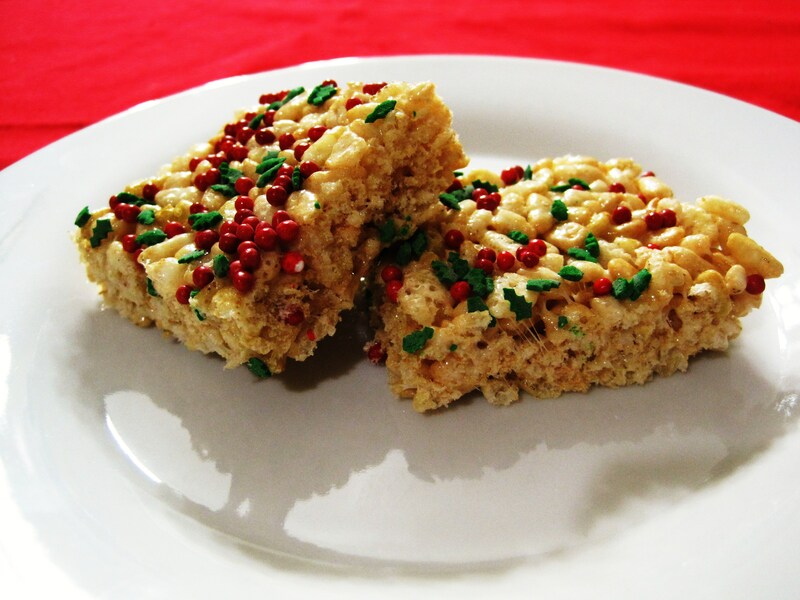 Your probably thinking, everyone knows how to make Rice Krispie treats, but I thought it would be nice to remind you, since sometimes the good stuff gets forgotten and besides Rice Krispie treats makes everyone smile. This is great for the kids too, and the little kids in us! Well I am off, I need to whip up a quick batch of something for a morning potluck! Have a great day!!! How cute are these! 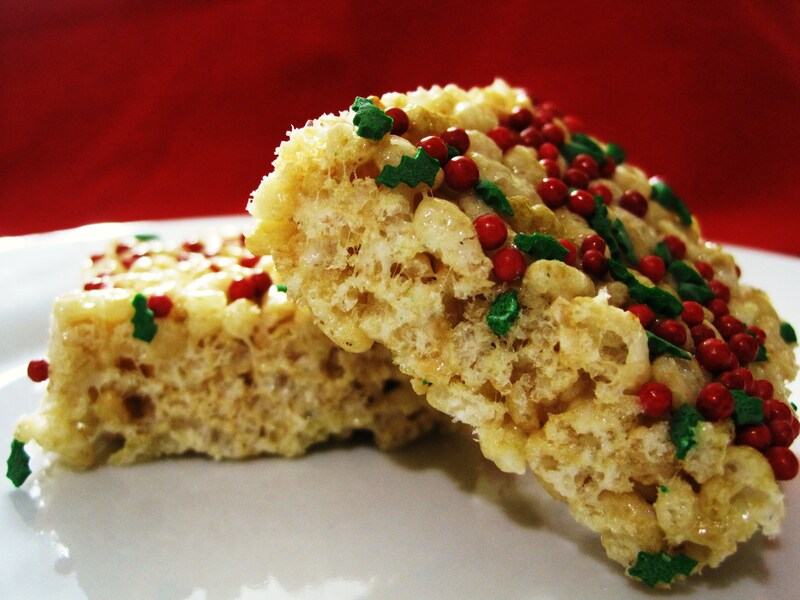 I really should start stocking rice krispies in my apartment so that I can make treats whenever the urge strikes. Which might be daily. They’re just so good! Aww these are so cute! And they look oddly familiar – I feel like I must have had them as a kid. Thanks for bringing them back!! I love the Christmas-y touch! Merry Christmas to you too! These are so adorable! I LOVE the sprinkles! It was very nice of you to let hubby take them to work! As for self-hosting…I have no idea! I’m not self-hosted, but best of luck and I look forward to seeing what changes you decide to make!